Backed by billions of dollars in government funding, China in 2014 launched a major initiative to advance its domestic semiconductor, IC-packaging and other electronic sectors. So far, though, the results are mixed. China is making progress in IC-packaging, but the nation’s efforts to advance its domestic logic and memory sectors are still a work in progress. In fact, China has yet to achieve its goal of closing the technology and trade gap with foreign chipmakers. The government isn’t throwing in the towel, however. On the contrary, it continues to invest in the semiconductor sector, and now it appears to be putting its emphasis on one area in particular—memory. The nation’s memory efforts are being expanded on two fronts. 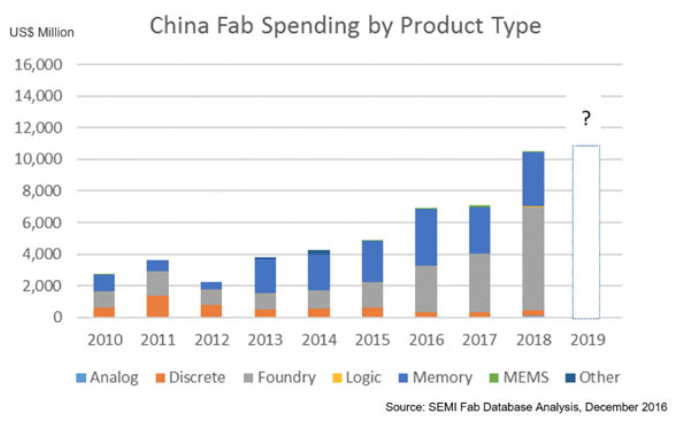 On one front, three multinational companies—Intel, Samsung and SK Hynix—are expanding their memory production in fabs within China. On a second front, China hopes to get its own domestic memory sector off the ground, and for good reason. It must obtain or import the vast majority of its chips from foreign suppliers, creating an enormous trade gap in the arena. To help jumpstart its domestic memory efforts, China has attempted to acquire multinational memory makers or to form technology alliances with them. So far, most of the multinationals have balked, citing national security and intellectual-property concerns, or their governments have stepped in to stop the deal. The Committee on Foreign Investment in the United States (CFIUS) has been active in blocking Chinese investments, according to numerous industry sources. • In December, China unveiled a $24 billion memory project in Wuhan, the capital of the Hubei province in central China. Yangtze River Storage Technology (YRST), which is spearheading the project, hopes to build 3D NAND fabs. YRST itself is backed by China’s Tsinghua Unigroup, a state-run company. • Tsinghua Unigroup has a separate DRAM and 3D NAND fab project in Nanjing. The total investment is over $30 billion in that project, making its total investment in the memory segment at a whopping $54 billion, at least for now. In addition, Tsinghua Unigroup also recently acquired a memory design house in China. • China’s Jinhua Integrated Circuit Co. (JHICC) recently broke ground on a new DRAM fab. JHICC obtained its DRAM technology from Taiwan’s UMC. • GigaDevice, a Chinese flash design house, is trying to get a memory fab venture off the ground. Not all projects will become a reality, though. Sino King Technology, which is led by the former chief executive of Elpida, has suspended its efforts to start a memory company in China. Still, China is moving full speed ahead in both memory and logic. In fact, semiconductor technology and manufacturing are playing a big role in one of the nation’s major initiatives, dubbed “Made in China 2025.” Launched in 2015, the goal of this effort is to upgrade and increase the domestic content of components in key industries. China’s IC efforts are fueling a wave of fab activity in the nation, creating a boom in the equipment industry. In total, wafer fab equipment (WFE) sales in China are expected to reach $7 billion in 2017, compared to $6.7 billion in 2016 and $3.4 billion in 2013, according to SEMI. In total, the worldwide WFE market is projected to reach $43.4 billion in 2017, up 9.3% over 2016, according to SEMI. Although China’s domestic IC sector is moving at a fast pace, the Chinese government has been grappling with the same problem for years. It is behind in semiconductor technology. This is a complex subject, but one of the causes is export controls. Multinational companies sell products into China, but they must follow various export control policies. Originally hatched during the Cold War period in the 1950s, export controls were established to limit technologies that could have potential military use. As part of those controls, multinational fab equipment makers for years were prevented from shipping advanced tools into China (and other nations) that were capable of processing chips at 0.25 microns and below. On top of that, China also lacked IC know-how, so it fell behind in semiconductor technology. Today, there are still export controls in China, although the regulations have been eased in some but not all areas. Generally, equipment makers can now ship more advanced tools into China. But it’s hard to play catch-up in semiconductors. So over the years, China has unveiled several initiatives to advance its IC industry. The country has made some progress, but every plan has fallen short of expectations. Then, in 2014, China launched an initiative called the “National Guideline for Development of the IC Industry.” The goal is to accelerate China’s efforts in 14nm finFETs, advanced packaging, MEMS and memory. At the time, China created a $19.3 billion fund, which would be used to invest in its domestic IC firms. And over the next decade, it could spend $100 billion across China’s IC sector. China launched these efforts for various reasons. First, it hopes to close the technology gap with foreign chipmakers. Second, China consumed 44.2% of the world’s chips in 2016, according to Gartner. Yet, its chipmakers produce only a small fraction of the world’s ICs. In total, China produced 7.8% of the world’s IC in 2009, but that figure grew to 12.7% in 2015, according to IC Insights. 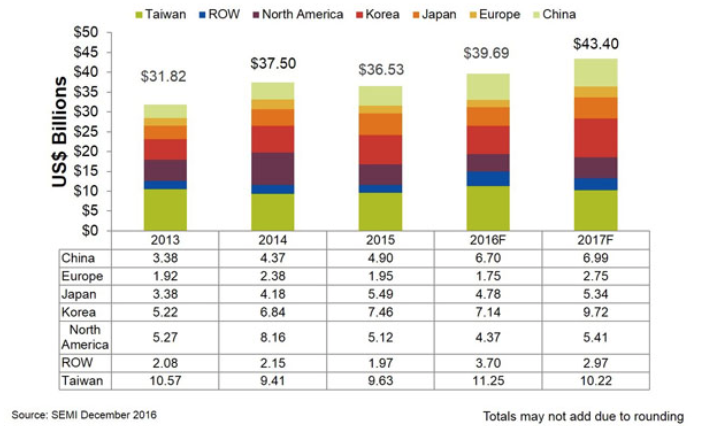 By 2020, China is expected to make 20.9% of the world’s chips, according to IC Insights. All told, China’s new strategy is much different than past efforts. “The Chinese government is actively attempting to reshape the domestic semiconductor market with significant capital from both government and private sources and to assist local companies in becoming key players in the global semiconductor market,” said Joey Tun, principal marketing development manager at National Instruments (NI). “Although this is not the first time the Chinese government has taken on propping up the domestic semiconductor industry, though with limited success in previous times, both the scale and breath of this effort points to significant opportunities and long-term implications for multinational companies,” Tun said. So what is China’s strategy? Basically, China hopes to develop its own technology. If it doesn’t have the know-how, it will simply acquire a company to obtain the technology. One of China’s first big moves was in IC packaging. In 2014, JCET, China’s largest IC packaging company, acquired Singapore’s STATS ChipPAC, a move that put China in the upper echelon in the arena. Then, China focused on logic. The nation boasts a sizable number of fabless design houses. But for leading-edge chips, China’s design houses must rely on the multinational foundries. China itself has a number of foundry vendors, but the most advanced process among the local companies is 28nm planar. Hoping to advance its logic technology, SMIC, Huawei, Imec and Qualcomm in 2015 formed a joint R&D venture in China. The venture plans to develop 14nm finFET technology by 2020. Not all of the action is at the leading edge, however. For example, SMIC, China’s largest foundry vendor, recently raised its capital spending, primarily due to strong demand for more mature processes like 65nm and 55nm. The demand is fueled by several chip applications in the China market, such as digital TVs, set-top boxes and RF. “We’re seeing companies in China trying to position themselves to play in the IoT space,” said Walter Ng, vice president of business management at UMC. Seeking to get a piece of the action, GlobalFoundries, TSMC and UMC are building new fabs in China. For example, UMC recently opened a 300mm joint venture fab in Xiamen, China. Initially, the fab will produce 55nm and 40nm chips. Meanwhile, China also is ramping up its memory capacity. The nation’s memory business is divided into two categories—the multinationals and the domestic players. In 2006, SK Hynix was one of the early multinationals to build a memory fab in China. Today, SK Hynix’ Wuxi-based fab represents about half of its total DRAM output. The company plans to expand that fab with an investment of $808 million. Then, in 2014, Samsung began ramping up its new 300mm fab in Xi’an, China. This fab, which is producing 3D NAND, recently expanded from 20,000 to 30,000 wafer starts per month, according to Pacific Crest Securities. Samsung is also expanding its 3D NAND production in fabs within Korea. “For NAND, overall demand will increase due to content growth in all applications,” said Chun Sewon, senior vice president of memory marketing at Samsung, during a recent conference call. Intel, meanwhile, converted its China fab from 65nm chipsets to 3D NAND in 2015. Today, Intel is shipping 3D NAND from its Dalian-based fab. Still, the multinationals can only produce a tiny percentage of China’s memory needs, prompting the government to jumpstart its own 3D NAND and DRAM efforts. China started the ball rolling with Wuhan Xinxin Semiconductor Manufacturing Corp. (XMC). Founded in 2006, Wuhan-based XMC is a NOR flash foundry vendor. In addition, XMC has been developing 3D NAND as part of an alliance with Spansion, now part of Cypress. Last year, Tsinghua Unigroup acquired a majority stake in XMC. Then, XMC was moved under a new group called YRST. Tsinghua Unigroup owns roughly 50% of YRST. The other portion is owned by China’s National Integrated Circuit Industry Investment Fund. Under its new parent, XMC will continue to focus on the NOR foundry business, according to company officials, but XMC will no longer pursue 3D NAND. Instead, YRST will develop 3D NAND. As part of that plan, the government recently announced a new $24 billion memory project in Wuhan. Led by YRST, the entity hopes to build at least three 3D NAND fabs. China is focusing on 3D NAND for good reason. Today’s planar NAND is nearing its physical limit, thereby requiring a new technology—3D NAND. That technology resembles a vertical skyscraper. It consists of multiple layers, which are stacked and then connected using tiny vertical channels. But 3D NAND is a difficult to make. YRST is working on its own 32-layer 3D NAND device, according to sources, but the yields are low. It’s unclear if it is still developing the 3D NAND technology from Cypress/Spansion. Regardless, China will struggle in 3D NAND. “Looking at the struggles that the current NAND players have had in developing their 3D NAND, it may take longer than expected (for YRST to make 3D NAND),” Forward Insights’ Wong said. Besides the 3D NAND effort, Tsinghua Unigroup has a separate fab project in Nanjing, the capital of China’s eastern Jiangsu province. The goal is to build 3D NAND and DRAM fabs. The details of this project are sketchy. Tsinghua Unigroup has a separate subsidiary, dubbed Unigroup Guoxin. Last year, meanwhile, Unigroup Guoxin acquired a controlling interest in Xi’an UniIC Semiconductors, an IC memory design house. There are other memory efforts in China, such as JHICC. The DRAM hopeful is based in Jinjiang City in the Fujian province in southern China. Its investors include Fujian Electronics & Information and Jinjiang Energy Investment. JHICC plans to invest $5.65 billion to build a new 300mm fab. Initially, it will develop DRAMs at the 3xnm node. It obtained the technology from a licensing and R&D alliance with UMC. UMC isn’t involved with JHICC’s fab operations, however. Meanwhile, details are sketchy about another memory hopeful—Hefei ChanGxin. This company is a joint venture between GigaDevice and the Hefei City Government. The plan, according to MIC’s Yang, is to build a memory fab in Hefei, the capital of the Anhui province in eastern China. In another twist, GigaDevice plans to acquire Integrated Silicon Solution Inc. (ISSI) from China’s Uphill Investment, sources said. In 2015, Uphill acquired ISSI, a U.S.-based specialty DRAM maker. ISSI declined to comment. Security, process variation, shortage of other IP at advanced nodes, and too many foundry processes.